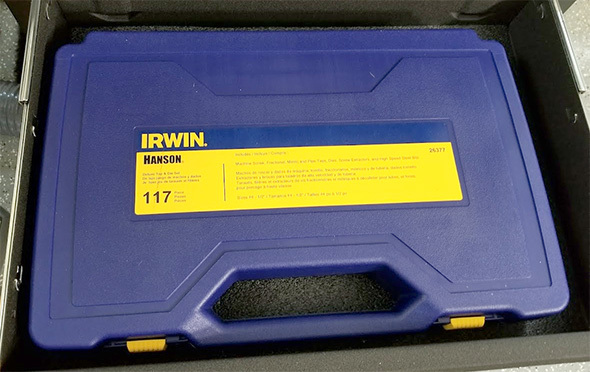 ToolGuyd > Hand Tools > Precision Tools > Ooh, an Irwin Hanson 117pc Tap and Die Set! Out of the blue, one of my Stanley Black & Decker contacts offered to send me an Irwin Hanson 117pc tap and die set to review (model 26377). Yes, please! Years ago, I bought some individual taps and tap drills in the sizes I needed. I also bought Kobalt sets, for cheap. The Kobalt sets were… less than I would have liked. I looked at Craftsman sets. The consensus online was that they quality was so-so. I kept looking at the Irwin Hanson 24606 set, currently $90 at Amazon. It’s a 41-piece set with a variety of taps, dies, tap and die handles, and a thread pitch gauge. “Too much for me” I thought. Now, I have a wide range of taps, tap handles, a full set of drill bits, some spares, spiral taps, and I’ve even needed pipe taps. I don’t have many dies, though, as I add threads to holes much more than I need to thread shafts. I pieced together a nice selection of tools for myself. But every so often, I need a size, tool, or style that I don’t already have in my box, forcing me to order what I need, and put things on hold until it arrives. With a set like this, you have a wide range of taps, dies, and accessories, before you think you need it. I went the “buy as I go” route because my needs started small and grew over time. I’m glad that Irwin was eager to get this set in my hands, and I know that it will come in handy in coming weeks and months. Will it handle all of my tapping and threading needs? No. But that’s because of the projects I like to work on. I do more thread-cutting, rather than thread repairing. When I use a tap or die, it’s because I’m making something new, not fixing something. IRWIN prides itself on working with a variety of tradesmen to solve endless fastening challenges: IRWIN® HANSON® Tap & Dies are the answer. Whether creating new tools from raw steel or repairing damaged and worn threads, a precise fit is essential. 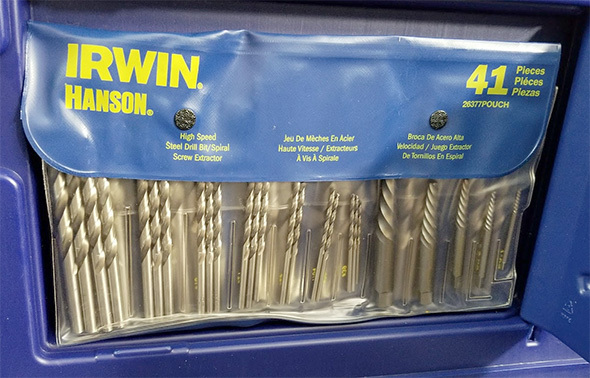 IRWIN Industrial Tools® sets the standard for delivering quality every step of the way in threading applications. As I mentioned, we understand you cannot guarantee editorial coverage, but we would love for your publication to be aware of this trusted product from the IRWIN line. I left that last part in, because it was mentioned a few times. I’ve been aware of Irwin Hanson’s tap and die products for a while. I think I also have samples of their modular kit around here somewhere. Hanson has a very good reputation. The taps and dies included in the 117pc set sent to me? Made in the USA. There’s a 41pc drill bit and screw extractor set stored behind a panel in the top lid area. When it comes to taps, I use taper, plug, and bottoming taps often. That’s to create new threads. Sometimes I use spiral taps for through-holes or in 80/20 extrusions. This set comes with plug taps, the most commonly used style for many threading and repair tasks. I’m pretty stoked here. I’ve been curious about Hanson taps and dies for a while, but never quite brought myself to buy a set. I’ll be testing them out on upcoming projects to see how well I like them. So far, I’m optimistic, as Hanson has a solid reputation. My only concern would be that the tools are made from high carbon steel (the drills are high speed steel), but I don’t think that’s going to be an issue. For thread repairing, or hand-tapping a few holes here and there, high carbon steel should be fine. If I know an upcoming project will require 20 holes in thick aluminum or steel, I’ll order what I need in advance, from an industrial supplier. This set is widely available. It looks like it could be a good option for tradesmen who need to repair or create new threads at a moment’s notice. Thank you to Irwin for the review sample! Looks like a great set! I wouldn’t need the extractor set though. I think It would be best for me to just purchase individual taps and or dies when I need them. Me neither, until I sheared the head of a 1/4″ hex bolt inside a workbench support. It took me a while to find my set, and then the Hanson set showed up the next day. 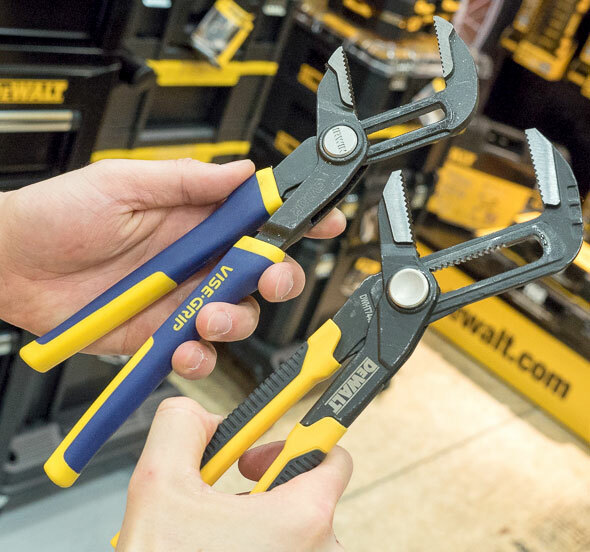 Extractors are the type of tool that you never need until you REALLY do. I’m not a fan of this style die as your only cutting tool. I’m even less enamored with this style extractor. I prefer split or 2-piece adjustable dies that provide you with some adjustment. When cutting hard steel – the die can be opened up – then a final cut can be made with the die closed in – or with a solid die. Cutting brass – it probably doesn’t matter – with the first pass being the final cut. Hex dies do have the advantage that they can be used in a deep socket and turned with a T-Handle ratchet – for tapping or cleaning up threads in hard to reach spots. This style of spiral twist extractor – IMO – works infrequently if at all. Before getting carried away using EDM in the shop – we’d first try a left-hand cobalt drill bit. Irwin sells them – plus ones in sets with these spiral extractors. My take is that the left-handed cobalt drill bit is worth a lot more than the extractor. In the trucks we’d carry a set of those combination drill/extractors like those made by Alden. They probably worked only 50% of the time. That looks to be a generic no-name brand. I’d steer clear. If going with an import set, I’d at least stick to a brand that I could complain to. The majority of the taps I have are made from high speed steel or are otherwise uncoated. With a set like that the TiN might just be for ooh la la marketing purposes. I have seen “titantium” drill bits at entry level price points that are just deal. With the same budget, I would be more inclined to go with a smaller set from a better brand. Or as mentioned, an established brand that I was more familiar with, such as Astro Pneumatic or Felton. The gold-appearance coating is often TiN, titanium nitride. It’s often used, at least on good tooling, for greater wear resistance and longevity. You can run the tools longer and faster. It is not universally beneficial. There are some materials where you might not want to use it on. I have a Hanson set and it’s very nice, I imagine this is the same. I have a few of the Irwin/Hansons and they’ve done everything I need. Gearwrench set has also done well. Buying any cheaper than those pricepoints are super risky, it’s not fun getting a broken tap out. Walton makes 3 and 4-flute tape extractors that fit the most common sizes. They don’t always work. For cases where there is no other choice (e.g. scrapping the item) – then EDM might have to be attempted. Sometimes taps (especially smaller diameter ones) get broken because of poor technique and/or misalignment. Getting the hole started correctly is important. Taper taps can help – but plug taps will do. Keeping things perpendicular (assuming that’s what you want) and aligned along the tapping axis is important. Frequent backing out – to clear chips is necessary. Choosing the right style tap and correct tapping fluid (if needed) for the material will help. There are jigs made by Big Gator to help keep taps in alignment. Flexbar and others make aligning tap guides. 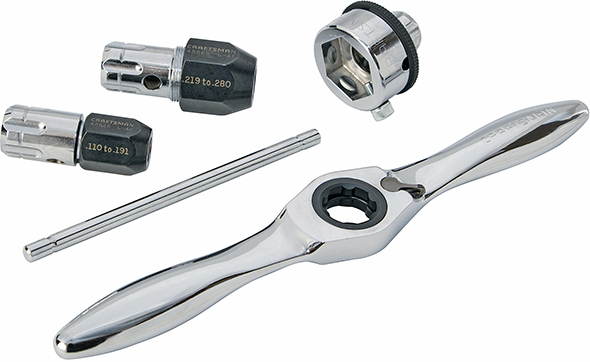 For machine tapping there are piloted spindle tap wrenches and “live-center style” spring-loaded tension pins (quality tap wrenches have a little centering divot on the top of the head). Jewelers and model builders often use a hand tapping machine (Grizzly sells an inexpensive one) to keep things in alignment. i think you will really like having this set. i guess it works for some people to pick and choose, item by item, but not me. i hate loose taps, dies and handles laying around. by the time you invest in what you feel you may need you are not that far from the price of a small set and then you won’t have the size you need as often you need that size right now. by the time you fill in the gaps and get a fairly complete assortment you will have spent as much or more than a set and you still have no organised way to store them. i have smaller sets of sae and metric and later picked up large sets of both. it is so nice to open up the box and have the item you need right now. about the time i think some sizes will never get used they do and i am prepared. 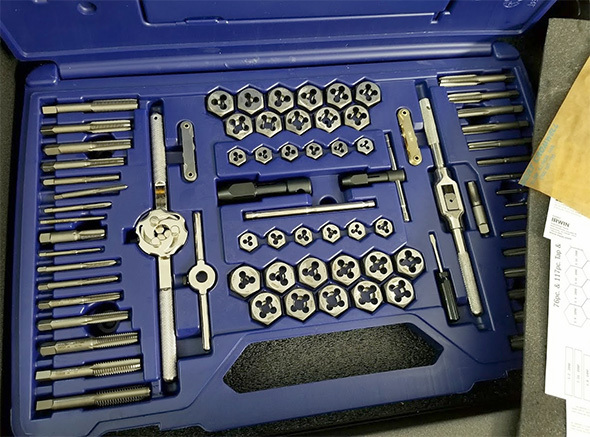 I don’t use a tap and die set to often and this looks like a nice little set to fit the bill, it has to be better then my HF set in my tool box now . The combination of extractor kit with the tap and die set should be explained. These are high carbon taps, you should NOT expect to use an extractor when (not if) you break one off. It can be blown out with an oxy-acetelyne torch (unless the workpiece is also high-carbon steel), or broken out with a hammer or chisel, since it was intentionally made brittle just for that reason. Or, use a LH thread Cobalt or Nobium drill bit, after starting with a center drill, and/or using a centering jig. The purpose of the extractor kit is removing broken bolts and studs, not broken taps. Then a tap can be used to clean up the threads, or create threads in the next larger size. I am also not a fan of the spiral extractors. There’s nothing wrong with Buy as you Go. If you find yourself buying often, it’s time for a set. Having duplicates of your most common items that you already bought is OK, because taps and dies are wear items, they don’t last forever. A worn tap is often useful for chasing chewed up threads, or making undersized threads when needed, so I keep them – separately. For extracting a broken bolt, I agree – with the exception of suggesting using a spotting drill bit in place of a center drill. The dimple produced will be slightly better suited to centering a LH cobalt bit. Spotting drills are probably in many machinist’s tool kits for use in accurate hole placement. Some old time machinists would also never use a Jacobs style chuck – rather selecting a machine with a collet chuck for precise hole placement. Naturally the more variables you can eliminate (to reduce runout, bit wander etc.) the better – so a collet chuck – spotting drill – then a screw machine length (rather than jobber length) drill bit might be chosen if precision is needed. Removing broken taps is a different kettle of fish. In my experience, EDM (more precisely MDM) is the way to go to disintegrate the center of a broken tap and save a mission-critical or irreplaceable workpiece when something like a Walton tap extractor fails or is not available in a size to fit a small tap. Rather than extractors, I want a set that includes the lettered drill bits. To me, extractors = chasing threads, not cutting them. I cringe at the cost, for a hobbiest, of a decent quality set of lettered bits. I cringed, too. But I have yet to regret buying my fractional, wire gauge, and A-Z drill but set. I’ve been eyeing the GearWrench 3887 75-piece set on Amazon, currently at $130 or so. Anyone have any thoughts? ?